"Every prison has a way out." Stars: Sandrine Bonnaire, Oleg Menshikov, Catherine Deneuve, Sergei Bodrov Jr.
Régis Wargnier's post war epic, Est/Ouest (East/West) is a reunion of some of the cast and crew from his earlier Oscar®-winning film Indochine. Along with co-writer and director Wargnier is his writing partner Louis Gardel and star Catherine Deneuve. The film was also co-written by the father of the male co-star, Sergei Bodrov, who joins Wargnier for the commentary track. Filmed on location in Bulgaria and Kiev, East/West is a testament to the sheer will of the post war Soviet peoples, and especially those seeking to escape the hardships brought on by life behind the Iron Curtain. In 1946 Stalin announced the repatriation of his people following the end of the second World War, as since 1917 some 30 million people had been displaced. Russians who had fled the country were returning to their motherland, among them is Alexai Golovin (Oleg Menshikov), a physician by occupation, who had spent the past ten years in France. With him is his French wife Marie (Sandrine Bonnaire), and their seven-year-old son. However, when their ship docks in Odessa, instead of the warm welcome they expected, they are shuffled off as criminals, interogated and beaten by the KGB, and accused of spying. Marie's passport is shredded, and word soon reaches them that they are the only passengers to be set free, as the remainder have been imprisoned or killed. The hopes of a new and better life in Russia are crushed as they are led to their new home, a communal apartment in Kiev. Faced with the appalling living conditions and a complete lack of privacy, Marie begs to return to France, but soon realises she is a prisoner, with no chance of escaping the communist regime. Alexei is given a job and finds favor in the authorities, while Marie becomes a seamstress for a dance company, all the while under the scrutiny of their neighbors, who are secretly reporting on their activities. After having been heard speaking in French with Marie, the head of their apartment is taken away by police, and Sacha (Sergei Bodrov Jr.), the young boy in her charge, is sentenced to be moved to a hostel. Instead Marie convinces Alexai to have the boy move in with them, and she begins mentoring him when he is kicked off his swimming team. She also begins influencing Sacha to help her escape the country, by defecting during the upcoming swimming championships he is training for. Desperate to return to France, Marie contacts Gabrielle (Catherine Deneuve), a performer from the west who is on a Russian tour, and makes a plea for her freedom, which while wanting to help, Gabrielle is unable to facilitate. The marital relationship strained by their circumstances, she turns to Sacha as her only hope. Her determination and patience, and the love and compassion of her few friends, may be her only chance at returning to her homeland; but the watchful eye of the KGB is always around the corner. With a bleak future ahead in Russia, Marie must decide what price is too high to pay for her liberation, as the loss of her husband and child may be her only way out. East/West spans decades in its story, and the real heart of the film is finding the strength to cope with and overcome the most overwhelming adversity by hanging on to the faintest sliver of hope. It also shows the kind of price paid by these people to hopefully regain their freedom. Nominated for an Academy Award® for best foreign film, this sweeping saga of Stalinist Russia exposes the hardships and paranoia at the beginning of the cold war. Strong performances are delivered by the entire cast, and though I felt Marie's character was the weakest of them, her predicament is a compelling reason to witness this production, and for those of us who take it for granted, East/West certainly gives one a clearer picture about what freedom really means. Image Transfer Review: The anamorphic image is clean with very few anomalies present. Film grain is well presented, black levels are solid and colors are appropriately earthy. Edge enhancement is visible in select scenes, but on the whole does not mar the image too badly, which is soft overall. Audio Transfer Review: Audio is presented in a combined Russian and French language tracks in Dolby Digital 5.1 and Prologic Surround. The soundstage is enveloping in 5.1, slightly less so in Prologic, with good frequency range, and only minor hiss. Extras Review: Included is a feature length commentary by director Régis Wargnier and writer Sergei Bodrov. The two discuss various aspects of the film, from the casting and locations, to scene specific details. There is also a fair deal of talk about why they made the film. Though both have fairly heavy accents, they aren't too difficult to understand. Since Bodrov's son was in the production, he asks Wargnier about working with him, and also acts as catalyst for other topics discussed during the film. Full frame trailers for East/West, Bossa Nova and Mifune are also included, along with brief talent files for Régis Wargnier, Sandrine Bonnaire and Catherine Deneuve. For those of us brought up in the west, it is hard to imagine the living conditions that many people around the world face. 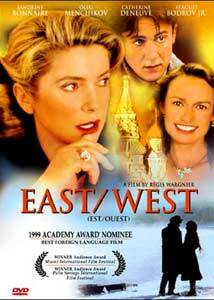 East/West tells a powerful story of hope and determination to escape from the cold war Soviet Union. For those who like international drama, this will take you behind the curtain, and follow one family's sacrifices and commitments in their fight for freedom.